Centurion Service Group will be hosting a live auction on Tuesday, January 6 and Wednesday, January 7 to sell over 4,000 lots of used medical equipment. A live auction will be held to sell over 4,300 pieces of medical equipment from hospitals, surgery centers and other medical facilities around the United States. Various types of equipment will be sold including radiology, surgery, cardiology, endoscopy, lab, anesthesia, exam and much more. The live auction will take place Tuesday, January 6 and Wednesday, January 7 starting at 9:00am CST both days. The equipment is at their Chicago warehouse located at 1400 N. 25th Avenue, Melrose Park, IL 60160. Anyone can participate in the auction including those who cannot make it on site. Centurion Service Group offers online simulcast bidding, as well as theater style bidding. Registration information and the complete list of medical equipment can be found on their website http://www.centurionservice.com. A few highlights of the sale are: a GE OEC 9800 c-arm, Datex Ohmeda Aestiva 5 anesthesia machines, CareFusion AVEA ventilators, Palomar Icon and Aspire lasers, Steris and Drager DEMO equipment, a Ford E-350 passenger shuttle bus and much more! Centurion Service Group is the world’s largest medical equipment auction house. Every month over 6,000 lots of unique and diverse medical equipment are sold in their Chicago, Las Vegas and Fort Lauderdale auctions making them a one-stop shop for all medical equipment buyers. With a continuous turnover of medical equipment coming from hospitals, surgery centers, and other healthcare facilities from around the United States their inventory is constantly changing. All auctions are simulcast online so that buyers from around the world can participate, and for a more personal experience buyers can inspect the equipment and participate in the auctions on-site. 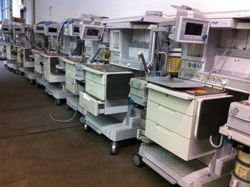 Centurion Service Group also has timed auctions to sell installed radiology and other high-valued medical equipment.